Snickerdoodle Bread is like a giant, soft and tender Snickerdoodle Muffin that has been topped with a hefty amount of sweet cinnamon sugar. 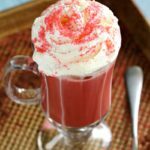 With the holiday season right around the corner, we started going through our Christmas recipe collection. 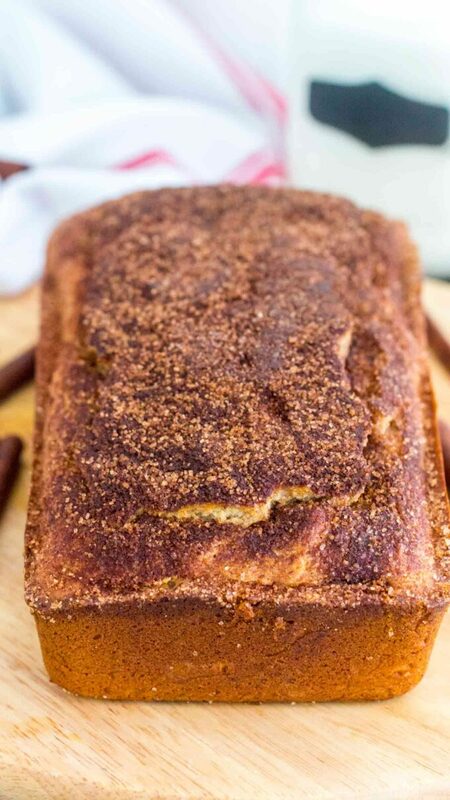 This Snickerdoodle Bread would make the perfect snack, coffee treat or brunch addition. If you are looking for more easy brunch recipes, check this Bread Pudding, Best Ever Coffee Cake and Chocolate French Toast Casserole. Tender, soft and full of flavor, this Snickerdoodle Bread is absolutely delightful. 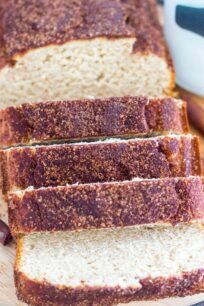 Fluffy and full of flavor, the bread is covered in a sweet and delicious Cinnamon Sugar layer. If you love Snickerdoodle cookies or muffins, you will love this bread. The bread is easy to make, and turns out amazing. 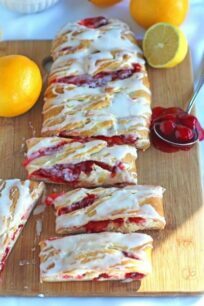 Perfect to wrap and have a slice on the go, or to wrap some and give as hostess gifts. This bread is definitely going to hit with everyone. Where the “snickerdoodle” name comes from? It is said, that the word snickerdoodle is a misinterpretation of the German word “Schneckennudel”, meaning snail dumpling, referring to the snail-like shape of the original biscuits. 1 teaspoon baking powder; baking soda; cream of tartar and ground cinnamon. Can I make Snickerdoodle Bread in advance? Yes! You can prepare the batter 24 hours in advance, store in the refrigerator and make sure you stir before using it. You will have to bake the bread a few minutes linger, if you start by using cold batter. How do you store Snickerdoodle Bread? Snickerdoodle Bread stores well at room temperature for up to three days in a sealed plastic bag. Snickerdoodle Bread can be frozen in heavy foil or freezer bags for up to three months. For either method, allow the bread to cool completely before adding to bags or wrapping it into foil. To reheat the bread, wrap slices in heavy foil and place it in the oven for 12-15 minutes at 300F. Additionally, do not thaw the slices before reheating. Grease a 9-by-5-inch loaf pan with nonstick baking spray (I like the one with flour) and set aside. In a medium bowl combine flour, baking powder, baking soda, cream of tartar, cinnamon and salt. Stir and set aside. Add butter and both sugars to a large bowl and beat until light and creamy. Stop to scrape the sides and bottom of the bowl with a spatula. Add egg, sour cream, vanilla and milk. Beat until fully combined and smooth. Stop to scrape the sides and bottom of the bowl with a spatula. Add the flour mix gradually into the egg and milk mixture, avoid over-mixing the batter. Once the flour mixture has been fully incorporated, transfer the batter into the prepared loaf pan. Brush the bread with melted butter and sprinkle cinnamon sugar on top. Bake the bread for 45-50 minutes. It varies based on the oven, but start checking on it after 40 minutes. A toothpick inserted in the center should come out clean or with just a few crumbs, but NOT raw batter. Remove bread from oven when ready and place loaf pan on a cooling rack. If desired, brush bread again with melted butter and sprinkle with extra cinnamon sugar if desired. This should be done while the bread is still warm. Cool bread in the pan for 10 minutes before removing and transferring to the cooling rack. Sounds like a delicious companion to my morning coffee! Yum! I love how easy this is to make! Bonus that the house smells amazing while it’s baking too! Snickerdoodles are my favorite! I could eat this whole loaf! 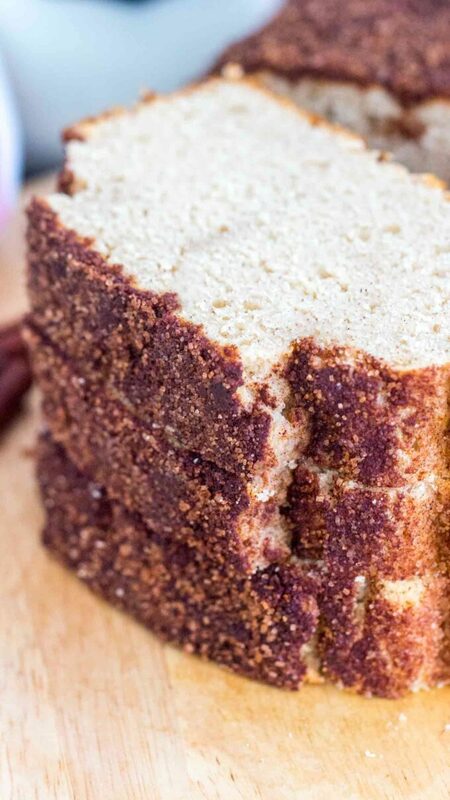 This snickerdoodle bread looks so delicious! Love that it can be made in advance. So perfect for gift-giving at Christmas! This look beyond delicious! So tasty and flavorful, really can’t wait to make this! There are two ingredient lists one with cream of tartar and the other without. Which list are you using? I made it without and it was wonderful. 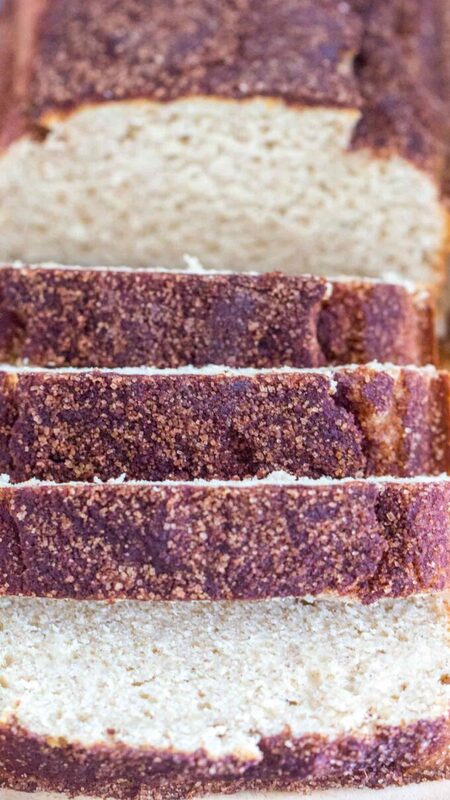 I’ve never heard of snickerdoodle bread until I found it on this site. Glad I did because this bread was amazing! It rose perfectly in the pan and browned up beautifully! 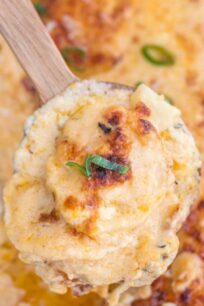 This recipe will definitely be in my “go to” recipes from here on out. Made two loaves for gifts. They are beautiful and tasty. Followed directions as written. NThank you!! !